They say the best way to see the Norwegian fjords is to sail through them. Nothing can prepare you for that moment when you look up and see the towering mountains above and the emerald green waters all around. You feel so tiny. Your heart skips a beat as you pass a waterfall tumbling into the fjord below and the peaceful tranquillity is overwhelming. There’s no place quite like it. Sailing through the fjords on a cruise ship is undeniably amazing, but getting up close and personal with the water in a tiny boat is another level! 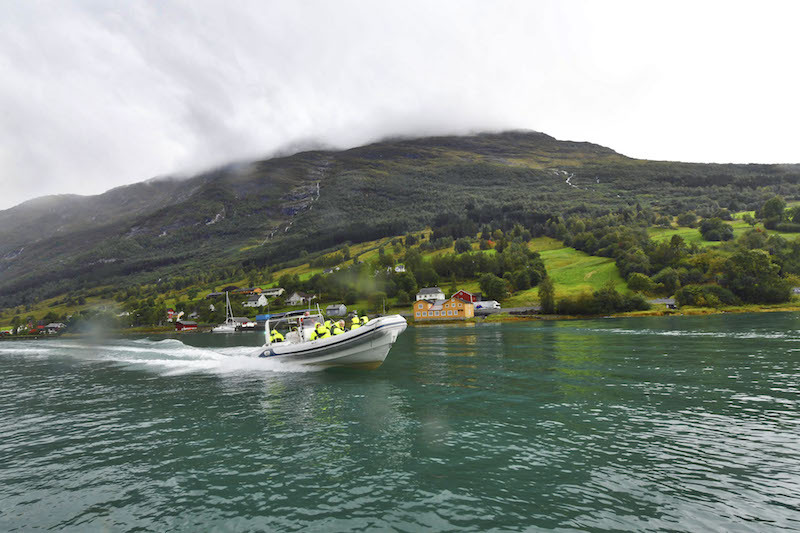 I was recently in Norway with P&O Cruises and I got the chance to experience some of the shore excursions available to cruise passengers visiting the fjords. Two of my favourite excursions were the ones where we got onto the water in smaller boats. It made me feel even tinier and made the scenery even more dramatic. 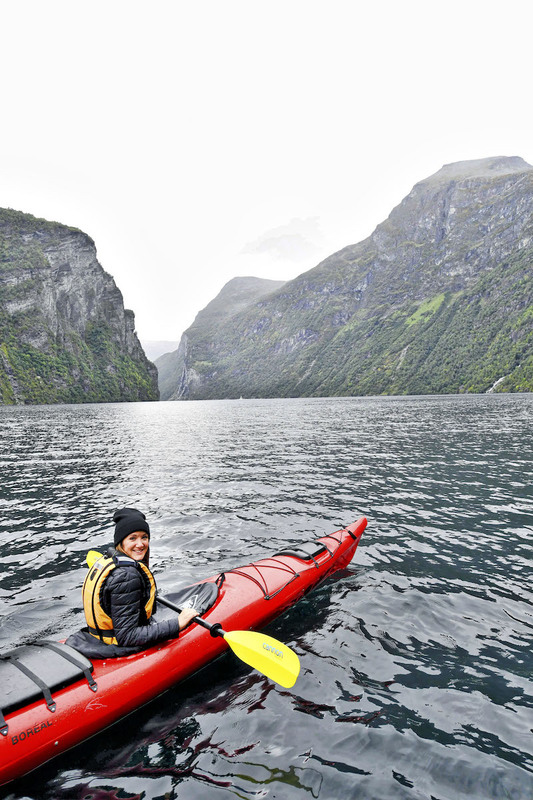 I took one kayaking excursion through the fjords and one high-speed rib boat ride and they were both incredible! 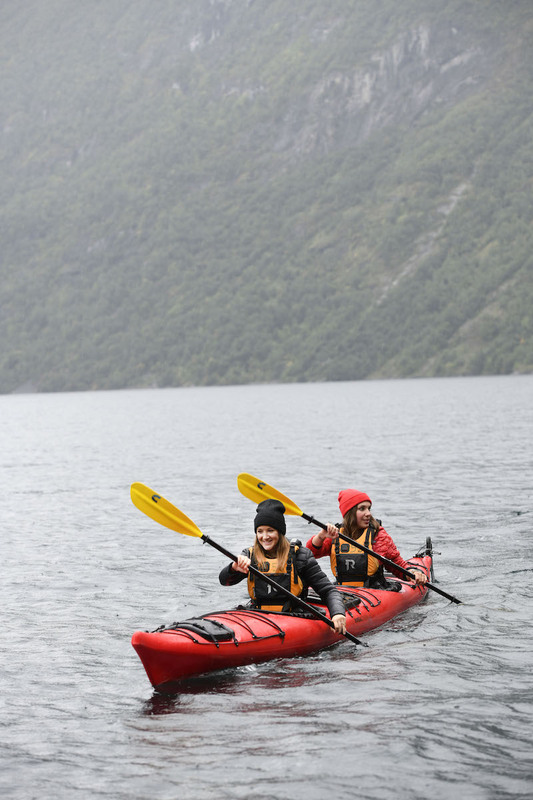 We arrived at the small kayaking centre next to the fjord and were kitted out with life-jackets and kayaking skirts before pairing up and hitting the water. My last kayaking trip had been in the sea in Menorca and, while it was undoubtedly warmer in Menorca, this was a much easier and more magical experience. 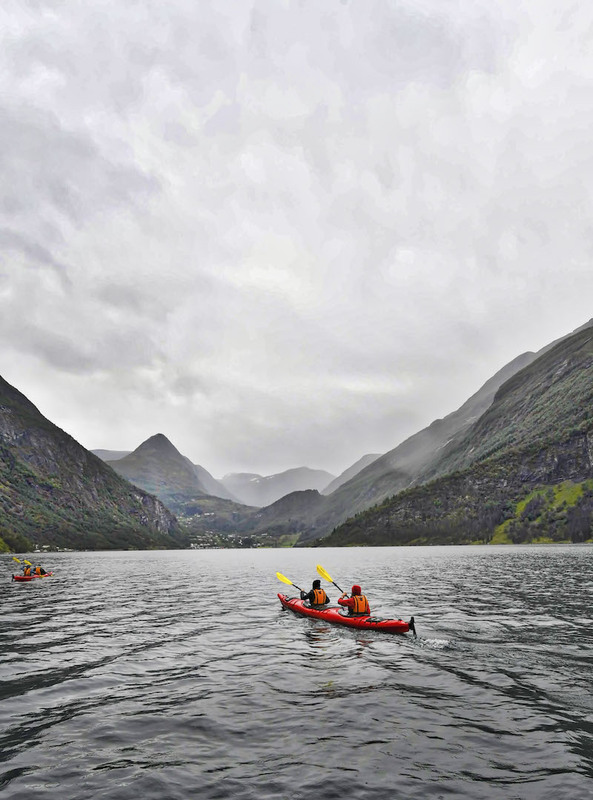 My paddle dipped into the glassy surface of the fjord and swept the water back with ease. It probably helped that I was sharing a kayak with the fabulous Sian from The Girl Outdoors (I mean, if you’re going to share with anyone, The Girl Outdoors seems like a pretty good choice!) who made sure she steered us well and kept our strokes synchronised. We glided through the dark water stopping only to look up at the view and appreciate the stillness. The occasional small boat would pass, sending ripples through the still water that rocked our kayak and made us whoop like school girls. Other than that, it was so tranquil we could have been the only people on the planet. I was surprised to look into the clear water and see hundreds of jellyfish below us. The water is so pristine you can easily spot them as their weird, alien-like forms bobbed below our kayak. I even managed to scoop one up with my paddle but quickly dropped it back into the water for fear of hurting it. I know so little about jellyfish I don’t even know how long they can survive out of water, but I couldn’t resist lifting them closer to the surface with the end of my paddle, so I could have a better look. Kayaking in the fjords was peaceful, smooth and relaxing so it was time for more of an adrenaline fuelled ride! Our next excursion in the Norwegian fjords was a high-speed rib boat ride that wasn’t nearly as tranquil as the kayak but was just as fun. Once again, we were kitted out with all the gear and this time it included a full waterproof suit. I wasn’t keen at first but it was one of the cosiest things I’ve ever worn and I appreciated the warmth once we were on the water! I climbed into the boat, taking a seat as close to the front as I could, as our skipper introduced himself and we whizzed off, skimming across the still surface of the fjord and sending my stomach flying. The water that day was incredible. It was as smooth as a mirror reflecting the bright green mountains and the tiny homes dotted along the coast. The only ripples were the ones we created by circling around the water and even then they were as smooth as mini road bumps. The clouds hung low and felt so close I could almost reach up and touch them – if I wasn’t clinging on to the side of the boat that is! We soon stopped at a bright orange buoy and our skipper began to reel it in. He’d set crayfish baskets the previous day and we leaned over the side of the boat in anticipation as he pulled up the basket. The first basket was filled with 5 or 6 pinky orange crayfish and we whooped with delight to see them. One of the crayfish had lots of eggs and one was quite small so we threw the back into the water before moving on to find more. We returned to the shore with grins plastered to our faces and were quickly offered a cold glass of crisp white wine. Well this was an unexpected surprise! I reluctantly removed my waterproof suit and took my wine to the shore where our skipper was boiling a huge pot of water ready for the freshly caught crayfish. He added plenty of salt and boiled them up quickly while we were ushered inside to an old mill that was converted into a small restaurant. A table beneath a chandelier was set with candles and fresh bread and we were shown how to eat our crayfish the traditional Norwegian way. The legs were removed for us and neatly sliced with a knife so we could snap them in half and use the tiny claws to prise out the precious meat. With the main body, we snapped off the heads and crunched the crayfish in our palms to crack the shell and reveal the delicious meat inside. Table manners were soon forgotten as we devoured the crayfish, mopped up the flavours with fresh bread and washed it all down with white wine. 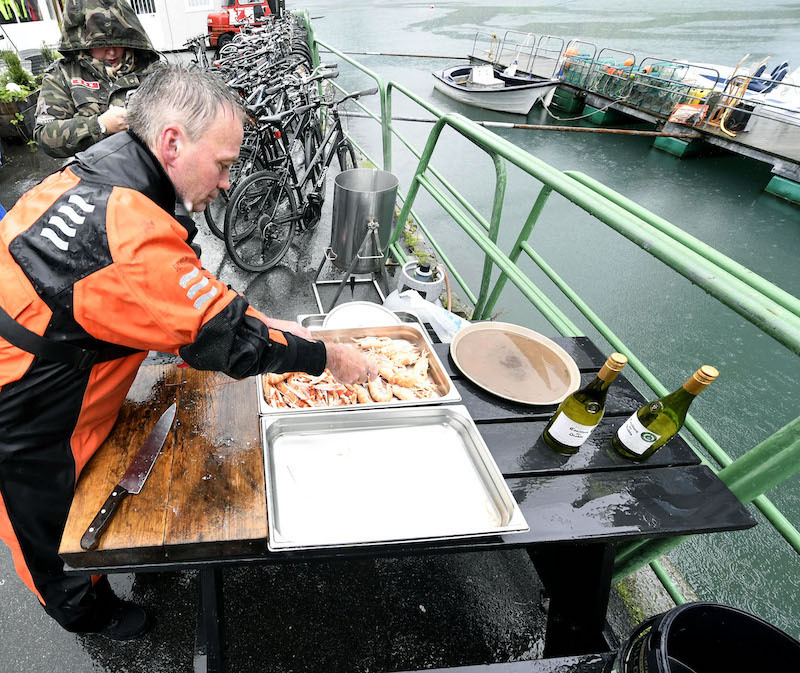 It was the simplest but most delicious meal I had in Norway – and that’s saying something because we had a lot of incredible seafood! 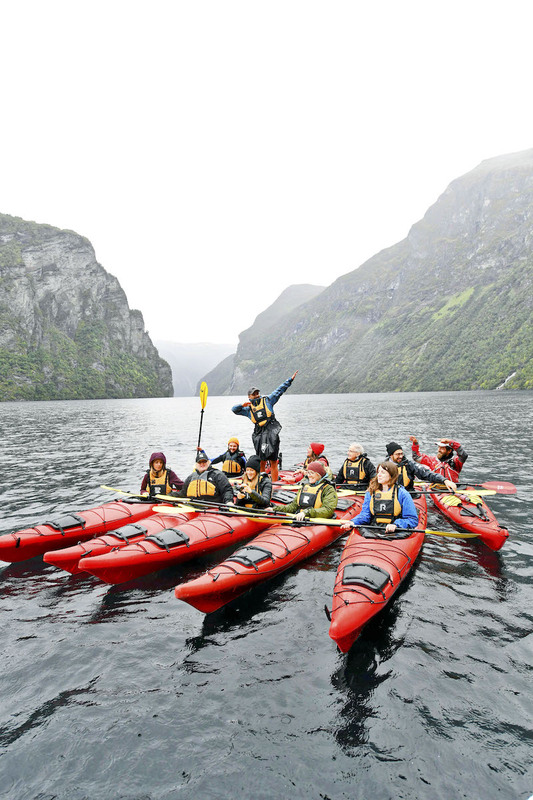 This trip was in collaboration with P&O Cruises to experience some of the incredible shore excursions available to cruise passengers travelling to the Norwegian fjords. I’ll be sharing more of my excursions over the next few weeks!